Looking at the weather forecast for this week, it’s becoming abundantly clear that, at least here in central North Carolina, running around outside is not going to be an option for the 4th of July. We just got through a weekend of 100 degree plus temperatures, and are heading into another sweltering week. So unless we strap icepacks to our extremities and roll around in SPF, we’re going to have to figure out another option. I am not ashamed to admit that it was a viewing of this very film somewhere around 1990 or so that really got me excited about American history. Up until that point, it didn’t feel very interesting. You know, just lots of guys in wigs signing papers and tossing tea into Boston Harbor, and something about taxes. 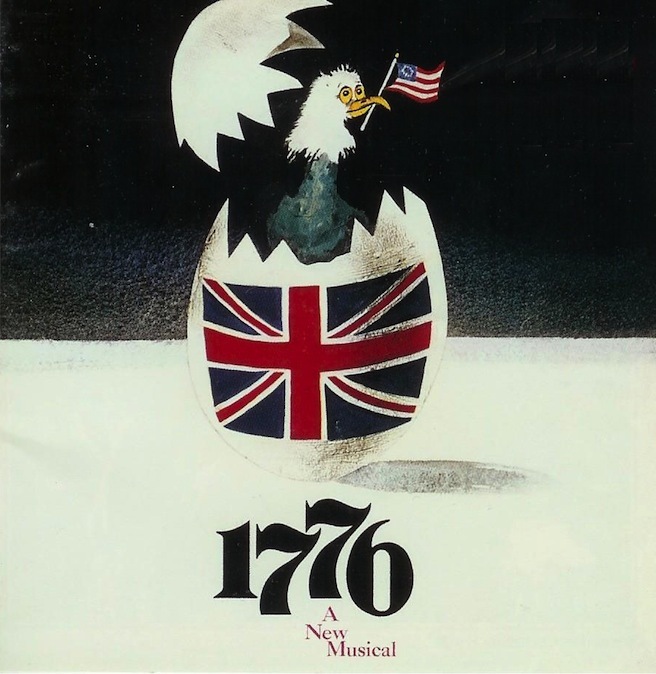 But suddenly, there were John Adams, Benjamin Franklin, and Thomas Jefferson arguing (in song) about which bird should be the symbol of America (for the record, I’m with Franklin; a turkey would have been awesome). I couldn’t resist. I was so inspired that I even did an elaborate drawing of the Second Continental Congress much to my mother’s befuddlement. With those infectious songs about saltpeter, Virigian lineages, and cranky Congressmen, who wouldn’t be so moved? While I was in college, I had the pleasure of seeing the live show, which is quite excellent (and doesn’t suffer from painful 1970s inspired hairdos — why is it that no matter how accurate a film is, costume wise, the hairstyles always date the film to the time of production?). Anyway, while the movie is special in its own way, the performance was really an experience (in a good way). If you happen to have the chance to see the stage production, please do! They even have a website. However, if you aren’t in luck and can’t see a live production, fret not! TCM is having a showing on July 4th. And also, there is (yes) a director’s cut available instantly on Amazon. Seriously, no excuses, people. This is practically required viewing*. I’m sorry to hear that I entirely missed a staged production with an entirely female cast that played in 2010. * Though, um, probably not a good film/musical to watch in preparation for your next American History exam. There are some slight deviations from historical fact.